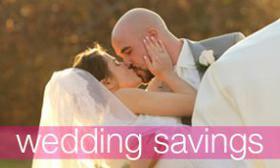 Are you looking for a way to make your wedding night extra memorable? 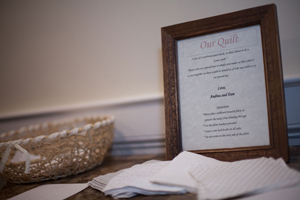 Something as small as the guest book could be a simple way for you to have a wonderful way to remember your special day. 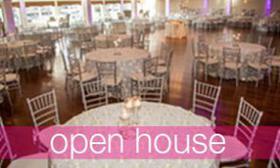 Spice up the memory of who was there to celebrate your big day and opt for a more creative route! Date night Jar: Leave out a jar and blank strips of paper and have guests write down their best dates night suggestions for you and your new spouse to enjoy after the wedding. You can also have guests write down their best advice. And by the end of the night you will have a jar that will help you keep the fire burning for many years to come. Define the Couple: Grab a dictionary and have guests circle and sign a word that they feel best fits you as the couple. This is a fun way for people to show you how they feel about your relationship and get guests to think outside the box. Build a Quilt: A quilt is a show the significance of the merging of two lives and to also remember all the people who were there to share the moment with you. Cut out a generous amount of cloth squares and provide fabric markers that guests can sign and you can later combine into a quilt. Not only will you be able to use it when cuddled up on a cool night you will also remember all those who shared your special day with you. Map It Out: Do you have guests coming from all over the country or even the world. Celebrate each of your loved ones heritage by having guest sign a map from where they have traveled from to join you on this special day. Or provide a map of the location you got married in and have guests sign that, you can then frame it and hang it in your home to always remember. 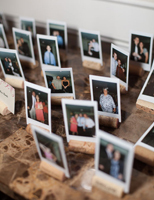 Polaroid Photo Album: Polaroid cameras are a quick and perfect way to change up the traditional guest books. Because they print instant pictures, have guest snap a quick selfie of themselves print it out and add it to a photo album. 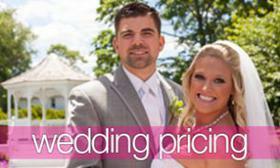 This way you will always remember who was a part of your big day! Home Warming Gift: Instead of a traditional guest book, use your guest book to create your own house warming gift for your home. Choose something that means something to you as a couple, if you love the beach use seashells, if you love to hike-- try pebbles or anything you want. 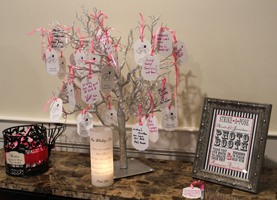 Have guest write their names on them and add them to a large glass case. This creates a wonderful centerpiece for a table or something you can hang in your new home together!